The shoot for Future Soldier Ghost Recon Alpha was one of the most enjoyable I’ve ever worked on. And it all started with an audition I prepared for completely wrongly. For some reason I got the message that I was auditioning for the role of a mid-ranking Russian Mafioso (these parts seem to crop up a lot) so I dressed accordingly in my best jacket and shirt, open necked to show this character’s daring side. In actual fact the character was the captain of a small boat; at worst a small time smuggler continually bugged by the local mafia and corrupt policemen for cuts of his goods. But where I had really got it wrong was that he was written as someone who had only worn a jacket once in his life on his wedding day so I had dressed completely inappropriately for the part. While with many auditions this might have jeopardised my chances of getting the role from the outset, fortunately in this case the casting directors and directors looked at the man not the clothes and saw something they liked in the performance and after they had explored some other possibilities of casting around the world, I got one of those calls from my agent that every actor dreams of, letting me know I had the part. The film itself was, to the best of the knowledge, something completely unique. It was made as a prequel to the latest edition of the computer game Future Soldier Ghost Recon Alpha, setting up the situation the player finds himself in at the start of the game. Now this made it very likely the most lavish, expensive and high production value short film of all time. Certainly the personnel involved had stellar reputations. The writing credits included Tom Clancy. The directors Francois Alaux and Herve de Crecy’s movie Logorama won an Oscar for best animated short film. The special effects team’s credits included the Transformers movies, the DoP was Trent Opaloch and the whole project was put together under the auspices of Ridley Scott’s production company RSA films. 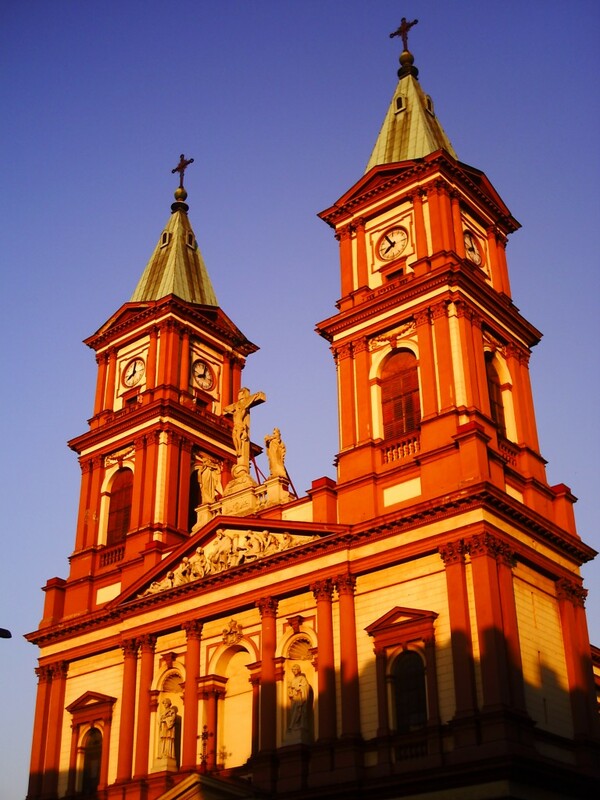 Filming took place in the Czech city of Ostrava, one of the centres of Czechoslovakian industry during Communist times. Most of the shoot was in a disused former steelworks: the kind of setting familiar to me from the TV sci fi shows I grew up on like Dr Who and Blake7. There were some beautiful sights in Ostrava. Also some quirky ones. 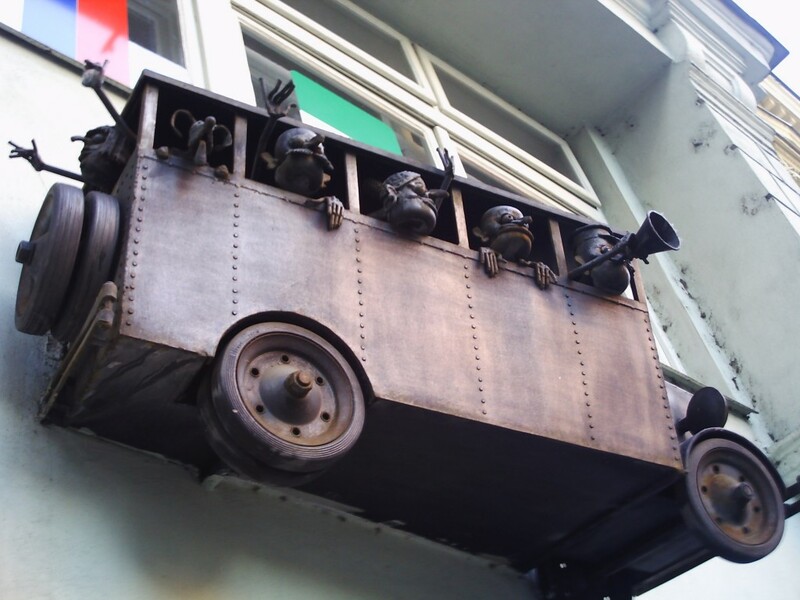 This sculpture was above the door of a travel agent. The stunt co-ordinator Pavel told us he used to work there as a teenager just out of school. 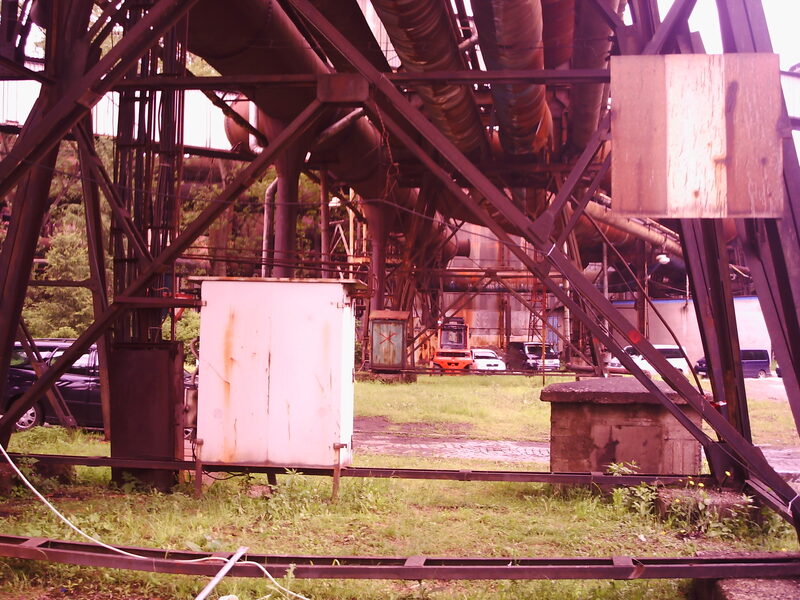 The intense heat of the steel furnaces dehydrated the workers so much that they could only work for twenty minute shifts before cooling down, for which purpose the management provided them with beer from the local brewery. He told us that the entire workforce was drunk halfway through the day from this regime and that the working conditions were so unbearable that there were frequent incidents of workers throwing themselves into the furnace. 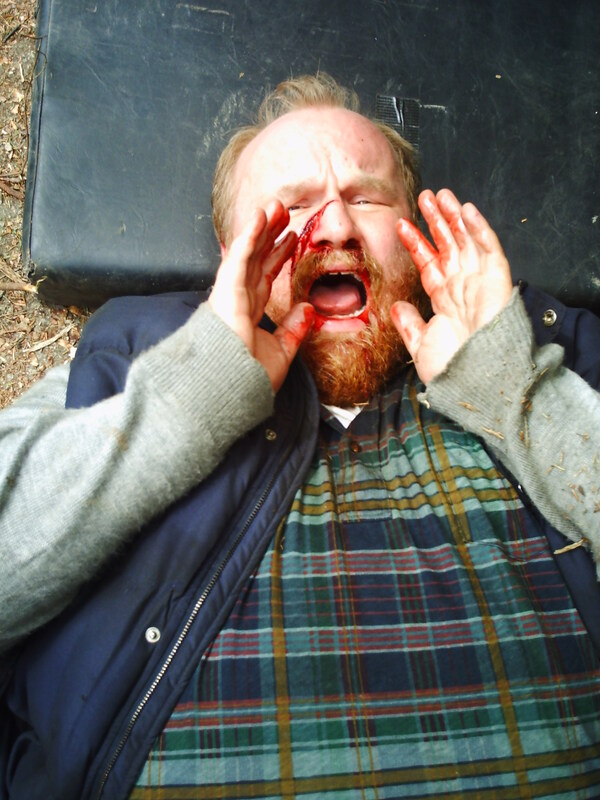 Nothing as terrible took place on our shoot, fortunately. By the time I got to Ostrava my character Dimitri had changed vehicle and was now a truck driver. 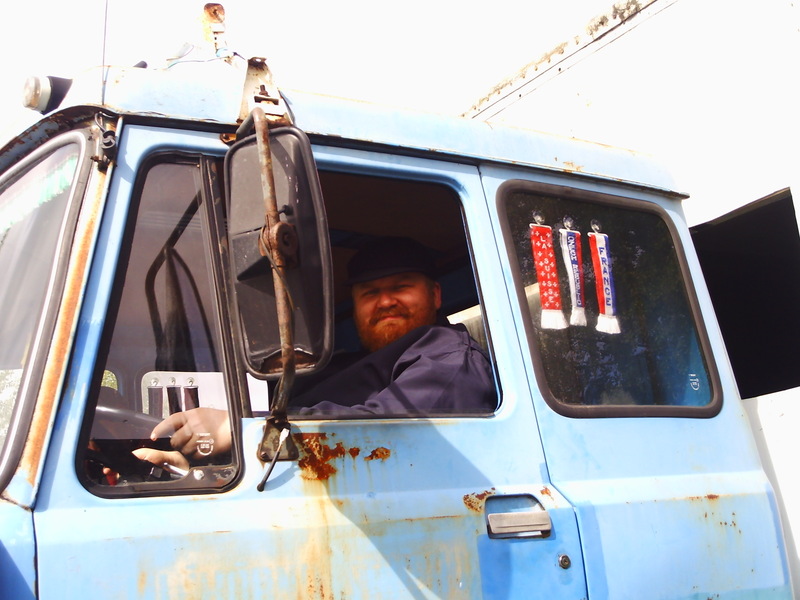 While I had played truck drivers before, notably in a Virgin Trains advert where I had to strangle Rik Mayall, driving a Soviet era truck was a whole new experience for which I had to do some intensive training. Dimitri in the place where he feels truly at home. My first experience of using a steering wheel so stiff it comes with a special handle for you to turn: Power Steering 1980s USSR style? Dimitri, haplessly sandwiched between the corrupt police patrol who stop him and the elite Ghost Recon Alpha squad he is smuggling, was a much more fashion conscious dresser than might be obvious at first glance, his several layers of clothing including a designer Ralph Lauren Polo shirt. 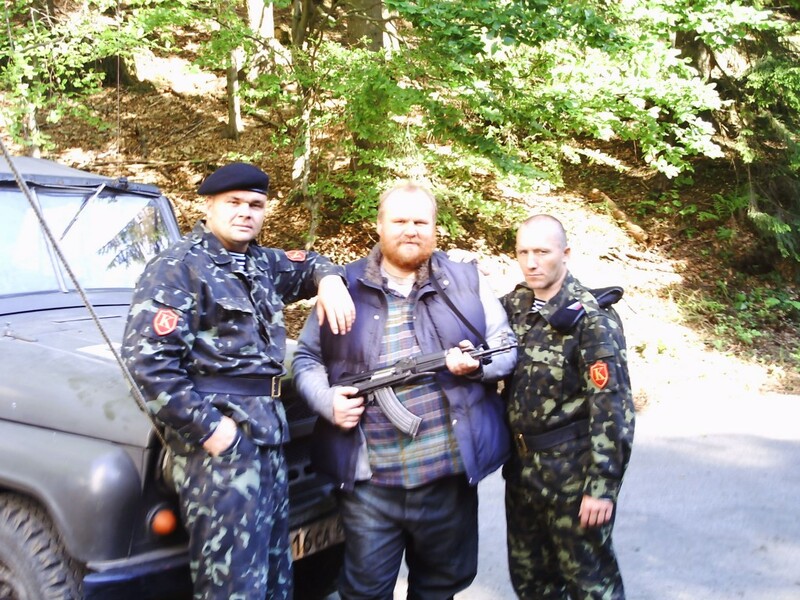 The scenes I was involved in were scheduled at the end of the shoot, in the beautiful mountains of Krasne Mesto. The bright light of the 40 degree heatwave that had started a few days before clashed with the gloom of the preceding filming so the call was for midnight to allow the look of the scenes to match as much as was possible. 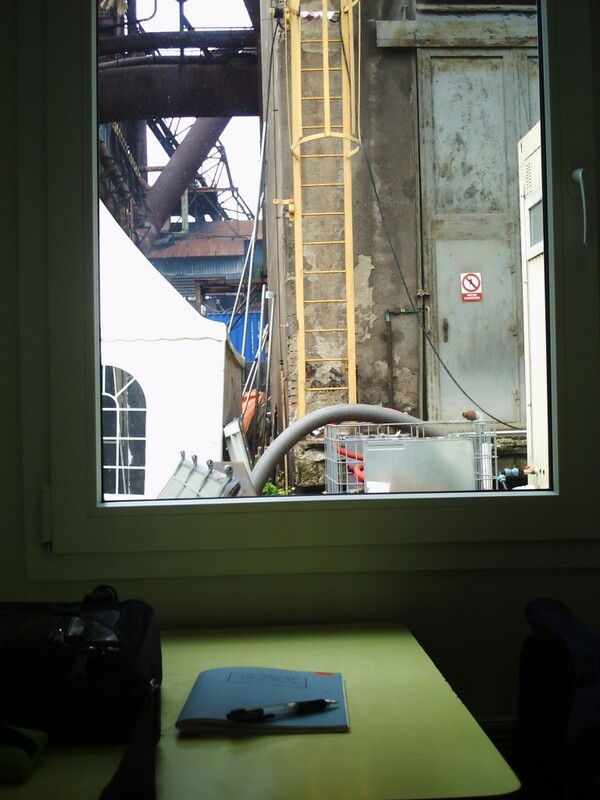 For an actor who is also a writer time spent hanging around in the green room is a great opportunity to take out the notebook work on your script and while in Ostrava I got a draft done of my screenplay. Unfortunately my green room colleague here seems to have found me a less than riveting companion. 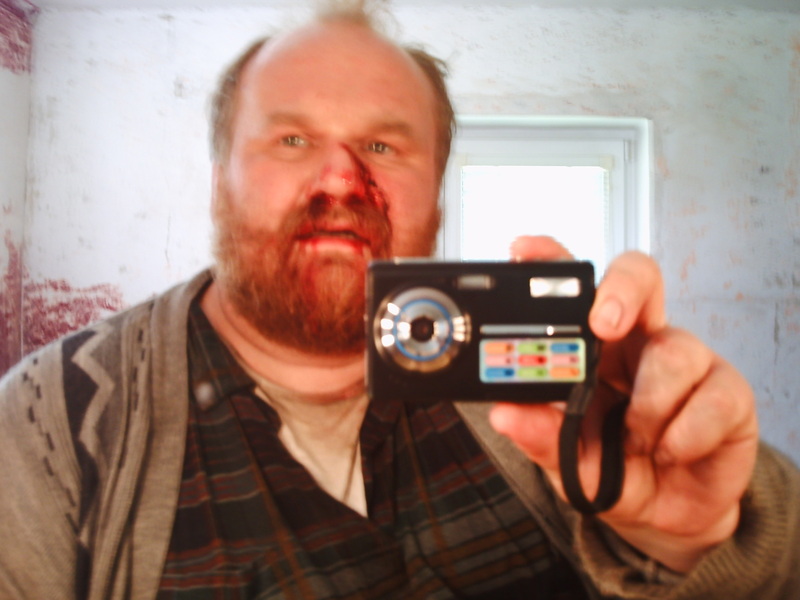 By the time my scenes were about to be shot some of the crew were teasing me that the previous actors had done a great job “so no pressure, Nick”, but with Chucky Venn pointing a gun at my head and Mark Ivanir demanding I get up and drive if I want to live, there wasn’t too much difficulty in convincing the audience I was terrified. … so he didn’t have enough left over to buy a selfie stick. It was a fantastic experience for an actor whose bread and butter has been low budget independent projects to take part in a film with Hollywood blockbuster production value and I couldn’t have asked for a happier shoot in which to have been involved. At the time of writing the YouTube version of the movie has over nine million views and over seven thousand comments, most of them favourable, including, I am glad to say, some good reviews for the truck driver and his Russian accent!